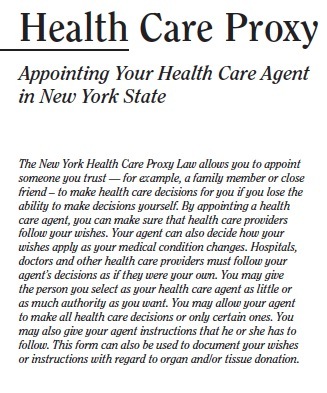 New York allows you to name a representative, called a proxy, to make decisions regarding your healthcare if you lose the capability to make them yourself. Appointing a healthcare proxy will ensure doctors apply your desired treatment, and enable someone who knows your values to make informed decisions as your condition changes. It is simple to complete this form. Write the name and the contact information for the person you choose as proxy. You can can choose your agent to have as much or as little power over your healthcare as you wish. You should think carefully about end-of-life treatments, and state clearly on the document how to proceed if you are terminally ill. For example, if you have brain damage without hope of regaining consciousness, you can specifically state that you would not like to receive any life-prolonging treatment. Also, be sure to discuss these treatments with your proxy.